Home email email recall Outlook 2007 Tips Outlook Gmail HOW TO: Recall Outlook 2007 Emails Quickly In 4 Clicks? 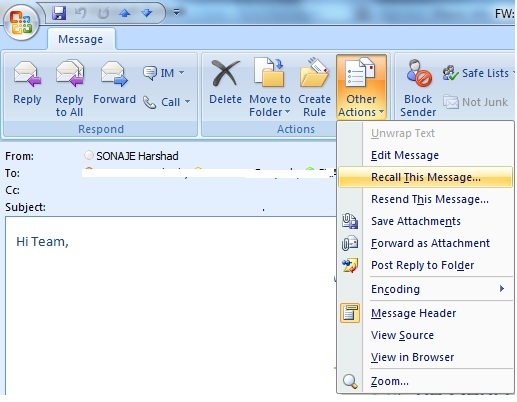 HOW TO: Recall Outlook 2007 Emails Quickly In 4 Clicks? We all make mistakes and sending stupid emails is a very basic mistake having disastrous consequences. But there is a way to recall your emails from Outlook and I will tell you how in just 4 clicks. Its no rocket science and is damn easy. 1. Simply Go to you Sent items. 2. Open the email you sent. 3. Go to Other Actions Menu. 4. Click on Recall Option. All the emails which are unread will be recalled. So if someone has already read your email then this email cannot be recalled and the damage is already for you. However Outlook will at least tell you that which copies of email Outlook was not able to Recall for you to asses the enormity of th damage. Share this with your friends who have sent you unintended stupid email on Outlook. Cheers.